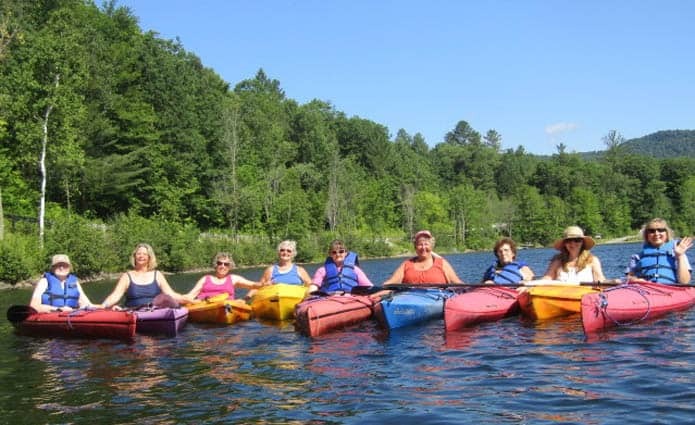 PLYMOUTH—Recently 10 ladies of the W2W cancer support group gathered for their 10th annual day of kayaking, picnicking and swimming on the beautiful grounds of Hawk Inn & Mountain Resort in Plymouth, Vt. W2W (Woman to Woman) is an open support group for women of all ages who have been diagnosed, at any time in their lives, with any type of cancer and who live in the Rutland County area. They gather at RRMC at 5:30 p.m. on the first Tuesday of every month, and additionally they enjoy many activities together such as art classes, kayaking, yoga, snowshoeing, picnics, Zumba, origami, reiki, knitting, scrapbooking, crafts, jewelry making and much more. If you know of a woman in need of a friendly, supportive and confidential environment, please contact W2W at goss64@myfairpoint.net or 802-265-8177 or visit womantowomanvt.webs.com. W2W cancer support group pictured (l-r): Mary Werbinski, Florence; Linda McGuire, Shrewsbury; Leslie Sternfels, Fair Haven; Carol VanGuilder, Rutland; Diana Haynes, Rutland; Patricia Pranger, Wallingford; Pam Blanchard, West Rutland; Paula Liguori, Florence; Lynn Rose, Rutland; and behind the camera Cheryl Gosselin, Fair Haven.